The profound and vast teachings of Buddhism were expounded for our present age by Shakyamuni Buddha. These doctrines were preserved for over a thousand years in India by a succession of unsurpassed masters of the tradition. During the eighth century this fully developed canon of teachings was firmly established in Tibet by Guru Padmasambhava. And since that time there has been a great flourishing of both the Sutra and Tantra traditions of Buddhism. The painting on this page depicts the Five Sakya Founders, the Ngor and Tsar Founders, Meditational Deities and a Protector Deity. Click to open a full size version. Four main schools developed within Tibet: Nyingma, Sakya, Kagyu, Gelug, each with its own incomparable lineage of teachers and emphasis on particular practices. The Sakya tradition, which developed from the early Nyingma teachings, has been preserved to the present day through the pure and unbroken succession of Khön lineage holders and through the transmission of the profound Sakya Lamdre (Path and Fruit) teachings. Due to the unimaginable compassion of masters throughout the centuries, the limitless teachings of Shakyamuni Buddha are maintained as potent and viable methods of spiritual realization. 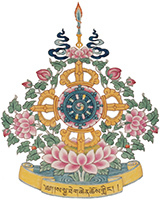 The Sakya Khön family lineage is thought of as divine because family records and Tibetan histories state that the noble family is descended from celestial beings from the Realm of Heavenly Clear Light. Five generations of these celestial beings are said to have lived in Tibet. A famous ancestor from the late eighth century was Khön Lu’i Wangpo (Nagendrarakshita), a noted translator, and a personal disciple of Padmasambhava (who erected Samye, the first Tibetan Buddhist monastery) is one of the first seven Tibetans ordained as a Buddhist monk. Since the 11th century, the Sakya male offspring are regarded as emanations of Manjushri, the Bodhisattva of Wisdom; Avalokiteshvara, Bodhisattva of Compassion; or Vajrapani, Bodhisattva of Power. In 1042, Atisha, the great Indian Buddhist master who helped revive Buddhism in Tibet, was traveling there spreading the Buddha’s teachings. At the side of a mountain where there was “pale earth,” he foresaw the emanations of three bodhisattvas whom he knew would spread the Buddhist doctrine in Tibet: Avalokiteshvara (the embodiment of compassion), Manjushri (the embodiment of infinite wisdom), and Vajrapani (the embodiment of infinite power). It was at the same site of pale earth some thirty years later, in 1073, that Khön Gönchok Gyalpo (1034-1102), built the first Sakya Monastery. The monastery took its name from the pale earth (in Tibetan “sa-kya”) where the monastery was founded. Subsequently, the town that arose there, the family of the monastery’s founder (the Khön lineage), and a school of Tibetan Buddhism took the name of the monastery: Sakya. The Sakya name is also renowned for having lamas as rulers of Tibet. The Sakya patriarch, Chogyal Pakpa (1235 – 1280) was given temporal authority over Tibet through the patronage of the Mongol rulers of China. Subsequently, the Sakya lamas governed Tibet for over 90 years. The Sakya School is one of the four great Schools of Tibetan Buddhism. The Sakya masters developed a tradition that emphasized study and meditation in equal measure. In Tibetan Buddhism, there are several ways to become a lama (a spiritual teacher and guide). Some lamas, called Tulkus, are recognized as rebirths of former lamas. Some of these are also considered to be emanations of bodhisattvas. The Fourteenth Dalai Lama is a good example, being the thirteenth reincarnation of the first Dalai Lama, Gendun Drup, and an emanation of the Bodhisattva Avalokiteshvara. Some, through their spiritual development in this life, are deemed to be lamas but are not regarded as rebirths of previous lamas. Finally, in some special families, all family members with blood relations to the father are considered to be lamas. The Sakya Khön lineage is one such family. In each generation of the Sakya Khön lineage, in order to preserve the family line, one of the males must keep the custom of the Lineage-holder (ngachang) – a white-robed, married lama. This tradition is distinct from the more prevalent ordained (rapchung) – red-robed monk-lama tradition prevalent in some of the other Tibetan Buddhist schools. Thus, in each generation, some Sakya Khön lineage lamas are not monks, but married lamas who continue the spiritual lineage. In accordance with the prophecy of the great Atisha, the Sakya lamas are regarded as emanations of Avalokiteshvara (the embodiment of Buddha’s compassion), Vajrapani (the embodiment of Buddha’s power), and or Manjushri (the embodiment of Buddha’s wisdom). Throughout its history, the Sakya family has produced adepts with supernormal skills. In the Tibetan tradition, psychic powers and what appear to be magical feats are accepted as a sign of one’s spiritual accomplishment. Some of the earliest ancestors are said to have been able to fly, others to hang their robes on sunbeams. The five founding lamas of the Sakya School of Tibetan Buddhism, in addition to being masters of the esoteric and exoteric teachings of the Buddha, were all child prodigies and performed numerous miracles. 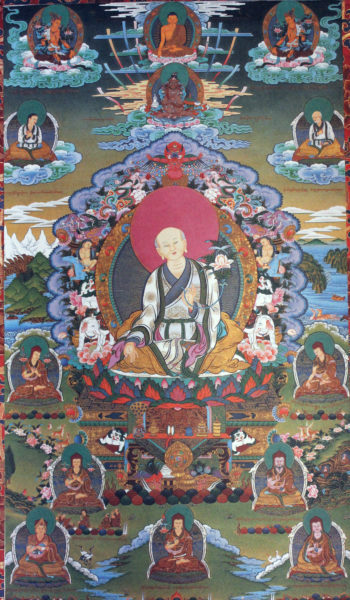 For example, when he was twelve years old and on a long retreat, Sachen Kunga Nyingpo (1092-1158) received a teaching in a vision from the Bodhisattva Manjushri. Sachen’s son, Teaching Master Sönam Tsemo (1142-1182) accomplished the incredible feat of memorizing the Chakrasamvara Tantra and other esoteric teachings before he was five years old. He passed away without leaving his body behind, and took his puppy with him! 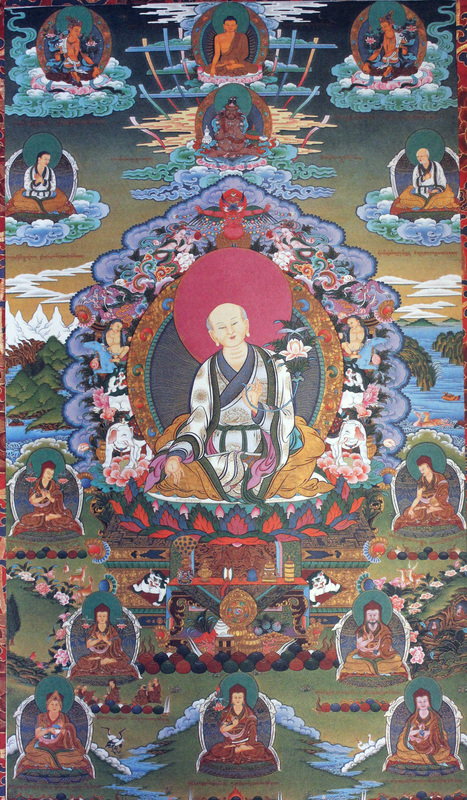 Sönam’s brother, Reverend Drakpa Gyaltsen (1147-1216), recited the Hevajra Tantra from memory when he was twelve years old. Much later in life, when he experienced a surprise visit by the Kashmir Pandita Shakyashribhadra, the Reverend Drakpa caused his ritual implements to float in the air. The Reverend Drakpa Gyaltsen’s nephew was Sakya Pandita (1182-1251), who knew Sanskrit as a child without being taught. As a teenager, he had a dream that he slept in front of a large stupa. Following that, Sakya Pandita was able to recall the teachings of the Abhidharmakosha from a previous lifetime without having been taught them in his present life. When Sakya Pandita was at the court of Godan Khan, the Khan’s sorcerers tested him by creating a magic, illusory temple on an island on a lake. Sakya Pandita blessed it and made it into a real temple. His nephew, Chögyal Pakpa (King of Religion, the Noble One) (1235-1280), as a young man, greatly impressed Kublai Khan, future emperor of China, by cutting off his own head and limbs, making a bloody mess. He then transformed his severed head and limbs into the five celestial Buddhas before making himself whole. His Holiness Ngawang Thutop Wangchuck (father of founder His Holiness Jigdal Dagchen Sakya and great-grandfather to His Eminence Sakya Khöndung Avikrita Vajra Rinpoche, His Eminence Sakya Khöndung Abhaya Vajra Rinpoche, and His Eminence Sakya Khöndung Asanga Vajya Rinpoche) was known to have performed miracles. When he beat a drum during a monthly protection ritual, the drum would emit flames. Once when he and his entourage needed to cross a roaring river, he caused the water to subside so his party could cross without mishap. Another time, the Tibetan government asked him to restore a Padmasambhava stupa (memorial shrine) on a mountain. When his party climbed to the stupa site, they found no water. He scratched some syllables on the ground and told everyone to leave the area alone until morning. When morning came, the party found a pool of water on the spot where the syllables had been drawn. They were then able to rebuild the memorial shrine.